Butterfly brooches and rings - setsThere are 4 products. Butterfly brooches and rings are handpaninted wooden jewelry that is OOAK and original. The motifs of joyful and colorful butterflies are unique and the jewelry matches many clothes in all possible modern colors. Butterfly brooches and rings represent unique, useful and very feminine jewelry and gift for women. You can present them this wooden jewelry with unique butterfly motif on many special occasions, like for birthdays, as an anniversary gift, unique and original business gift, etc. Gold and red set of a butterfly brooche and a ring with handpainted motif of lovely butterflies represent unique, niticeable, feminine and useful gift/jewelry for women who like different and ooak jewelry. IMPORTANT! Before purchasing this set of butterfly brooche and a ring register/log in to e-store Unikatnica. A turquoise butterfly brooche and a ring with handpainted motif of two lovely butterflies represent unique, niticeable and feminine gift/jewelry for women who like different and ooak jewelry. IMPORTANT! 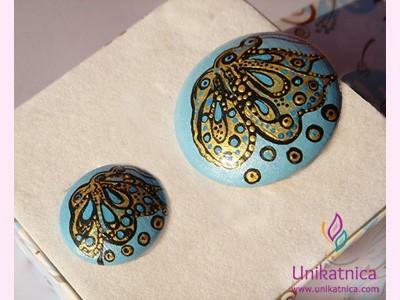 Before purchasing this set of turquoise butterfly brooche and a ring register/log in to e-store Unikatnica. A white and black butterfly brooche and a ring with handpainted motif of lovely butterflies represent unique, niticeable, feminine and very useful gift/jewelry for women who like different and ooak jewelry. IMPORTANT! Before purchasing this set of black and white butterfly brooche and a ring register/log in to e-store Unikatnica. An orange butterfly brooche and a ring with handpainted motif of lovely butterflies represent unique, niticeable, feminine and very useful gift/jewelry for women who like different and ooak jewelry. IMPORTANT! Before purchasing this set of butterfly brooche and a ring register/log in to e-store Unikatnica.